I thought I would give this a quick spin. With iceboot 0.3, as soon as I plug the BlackIce into my system (Ubuntu 14.04.5 LTS) the whole machine freezes and needs a hard reset to recover. I tried this a couple of times before reverting to iceboot 0.2. It's quite possible this is user error, as I'm pretty new to BlackIce. Unfortunately I had similar experiences. I found that although the dfuse utility claimed to program the STM32 it had only done a partial job and left the USB port as an unrecognisable device. However it did put up a Version 0.3 banner message out of the lower uart-USB port when reset was pressed. I reverted back to Iceboot version 0.2 to convince I wasn't doing anything wrong. I later tried using an ST Link programmer to program the STM32 over it's SWDIO and SWCLK - and this worked perfectly. Dfuse is not programming the whole file and missing some of the end off the hex file - perhaps when it does a hex to dfu conversion it tries to convert it to blocks and misses anything off the end that is not a whole block. Dfuse is somehow failing to program the identity into the USB port. I have heard reports from linux users who use dfu-util that it appears to work correctly. FYI, I'm not using Windows at all. I'm using dfu-util on Linux to do the programming and still hit problems. IceBoot 0.3 is slightly smaller than IceBoot 0.2, so it's hard to understand why 0.2 could be programmed, and 0.3 couldn't. Do you actually have evidence that the device was only partially programmed? My feeling was it was more likely to be an issue with the changes in 0.3. What tool do you use to convert from .hex/.bin to .dfu? I use the dfu file manager tool that STMicroelectronics supplies for windows. Regarding partially programmed - well it was certainly capable of generating the reset message through the UART, but the STM32 native USB was not initialised in a way that could be recognised as a virtual com port. I went back to version 0.2, and that appeared to program correctly by dfu - with the USB VCP identifiable. It was only when I programmed version 0.3 using the ST Link that it began to work as expected. I can't explain why - but I have put it down to the dfu programming process - which is outside of my control. It was my understanding that if you use dfu-util then you use the .raw file format. Richard Miller has posted earlier here (somewhere) the correct command to make it work. Richard has tested the dfu programming of version 0.3 with dfu-util on linux and reports that it works correctly. I've just tried again with IceBoot 0.3, but this time I rebuilt it myself from sources. Anyway, this version seems to work just fine, and doesn't hang my Linux machine any more. So it looks like the iceboot.hex that was checked into git is suspect. Ken, I'll email you my iceboot.hex and iceboot.dfu files if you like (the forum doesn't seem to allow zip attachments). Thanks for taking time to get to the bottom of this. Please email files - I think you have my email via BigEd. Good to see the OP6 communicating via the UART-USB adaptor - thanks for spending the time to get this up and running - at some point I'd be interested in featuring it in a blog post about some of the DIY cpu work that can be done with BlackIce - was 25MHz the upper limit of speed - or was that just a convenient divide down from 100MHz - as the PLL is not accessible? I also had some thoughts on how an OPC-like instruction set could be modified to handle an 8-bit immediate payload in the lower byte. This would allow short constants, short jumps, character comparisons etc to be performed efficiently - it would need an extra bit to define "8-bit" mode - but this could possibly be borrowed from the predicate bits? The reason I'm interested in this - is having written my SIMPL interpreted language toolkit in MSP430, I have come to realise that a lot of the instructions are actually dealing with 8 bit values - like the testing of incoming characters and jumping accordingly, or subtracting an 8-bit constant from a character - such as in the conversion of ascii to integer. The MSP430 already uses 2 bytes per instruction - but to do this it uses another 2 bytes to hold the constant. It occurs to me that if the 8-bit immediate can be included within the 16-bit instruction - then this can dramatically improve code density. Perhaps this is more a topic for the anycpu forum. 25MHz was just a convenient divide. The timing analysis said about 40MHz. Before we added the external RAM (and so lost the PLL), we did have it running at 40MHz, just using the internal BRAM. As far as the OPC instruction set is concerned, OPC 6 is pretty much fixed now, but there's always OPC 7, and this doesn't have to be backwards compatible. If you want to continue this discussion over on anycpu.org, Richard (	Revaldinho) will see it as well. He did most of the work on the CPU itself. Here's one more data point. So it's just the iceboot.hex file that seems to be problematic. Did Richard test that as well? That's interesting - because I will have used the .hex file to program using the ST Link. This suggests a .hex that fails when used with dfu, yet works fine with ST Link. We are having a myStorm get together in Hebden Bridge for Wuthering Bytes during the first week of September. Any of you West of Swindon chaps fancy a road trip? This is definitely a subtle issue! I've done a bit more digging, and found some interesting things. And apologies for the long post! And it turns out the -t 1024 is the significant difference. But with the older 0.2 version and with my own 0.3 build, the behaviour is different. i.e. it seems the -t 1024 is not needed. The first and third of these are a multiple of 8 bytes, but the second isn't, and it's the second one that fails without -t 1024. So to prove this I appended 4 extra null bytes onto each of these raw files. And that flipped the behaviour of each of them. So to put this in simple terms, it seems if the raw file is not a multiple of 8 bytes long, then the -t 1024 option must be used with dfu-util. This looks like a subtle dfu-util bug. I have a old version (0.50), as that's the version that comes with Ubuntu 14.04. So it's possible this has been fixed in a later version. This sounds exactly like what we are experiencing. 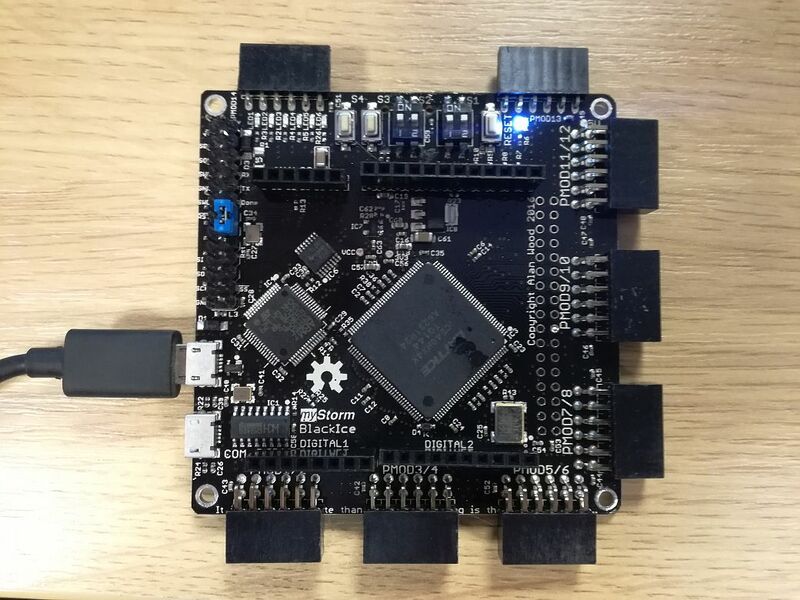 I wonder what bootloader version we have in the STM32L433 on the latest BlackIce boards? So yes, it's the buggy one! Wow nice bit of detective work there hoglet, really helps us with the weirdness that is DFU on these devices..
Dave, many thanks for this analysis. I've changed the makefile to pad out the .raw and .hex files to a multiple of 8 bytes, and put new binaries on the repository. Thanks for fixing this and updating the repositories - appreciated. I am now loading Version 0.3 onto all boards shipped - and then loading the OPC6 cpu - which is a good test of the external SRAM and the UART. Updated to version 0.3 but now I can not reprogram FPGA over it. Ok looks I have run into issue of reading old document for programming.